We’ve seen a number of examples lately of how negotiations and conflict resolution depend crucially on a single key factor: The parties to the negotiation or resolution must be willing to compromise on something substantive. If one side doesn’t want to be flexible, what you really have is just a strategic game where one side’s gain is the other side’s loss. On the other hand, there has to be a bottom line on both sides. If one of the parties is willing to give up everything to avoid a potential conflict or fight, then the side that has a higher bottom line will smell blood and will try to go for the jugular. The crisis that has been brewing as the US government approaches a shutdown of non-essential operations on October 1st shows that flexibility and compromise are required in negotiation in order to resolve conflicts. Neither the president nor the Republicans in Congress are willing to give up anything substantive. This means there are no real negotiations and therefore no realistic solutions to the budgetary standoff. I believe that parties to a conflict can always find common ground and a solution, if they are willing to put water in their wine. The second instance is illustrated by what we’ve witnessed since late August as US president Barack Obama “negotiated” his way out of a situation that he didn’t really want to be in in the first place. I’m convinced he had no intent of launching any kind of military action against Syria for its use of poison gas against civilians in a Damascus suburb in late August. Russia and the Assad regime could sense this, so they offered a way out to Obama, which would require little in the way of real concessions by Syria. By guaranteeing Syria’s purported chemical disarmament, Russia increases its influence in the Middle East, especially in the crucial Iran-Syria axis. Assad stays in power and doesn’t have to endure a strike by US forces. Meanwhile, the US, and especially the Obama Administration, lose face in the region. This will probably undermine any future attempts by the US to threaten the use of force to achieve its aims. Some may see this as salutary, but in the long run it may degrade the US’s credibility and freedom of action. These are critical in the game of Great Power relations. Two business partners I know have been in an impasse for years as they struggle to find a way to get out of their partnership. One partner is offering a very low price for the other’s share of the business while the other asks for a very high price. There has been little movement for at least two years as they stare each other down. They also haven’t accepted a common negotiating framework or forced the issue through legal or other strong-arm tactics, so the situation has stagnated. It is like two enemies watching each other across a fortified border, afraid to make a move in case the other side sees it as a sign of weakness. The reality is that this unresolved conflict is like a festering wound, infecting the rest of the organs that are still healthy. 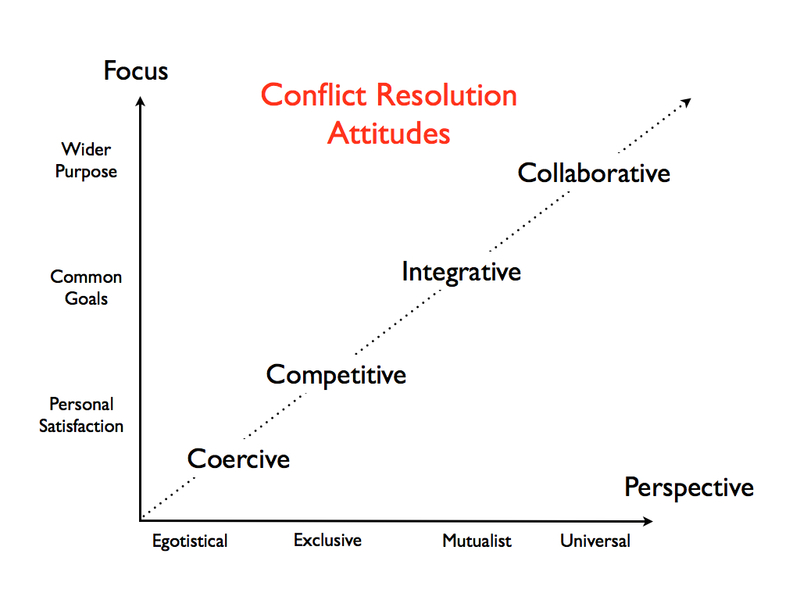 The following diagram shows that there are a number of attitudes we can adopt when faced with the prospect of conflict and negotiating to resolve it. In the first instance, we can take a coercive attitude, where one of the parties is unwilling to budge on anything substantive and forces the other into a losing position. Call this “winner takes all”; it reflects an egotistical perspective and the goal is the personal satisfaction of only one of the sides. A little more flexible is the competitive attitude, where the parties are trying to gain something at each other’s expense, but they recognize the need to create a transaction. In other words, I win something that you lose, but you gain something that I lose. It stems from a perspective of exclusivity, where my gain must entail your loss, and vice versa, and it is still reflective of a need to satisfy personal goals. The next level of resolution can be called the integrative attitude. In such a situation, both parties recognize the need to create a “win-win” solution. The idea is that we go beyond our parochial objectives to craft a common set of goals. We will cooperate in achieving these and it reflects a perspective of mutualism. The final and highest form of conflict resolution is what I call collaborative. With this attitude, parties to a conflict or negotiation try to see beyond their own objectives and focus on the wider purposes of their endeavour. They seek the good of society or of others beyond their immediate objectives as parties to the conflict. This reflects a universal perspective, where the focus is on benefiting “all of us” now and into the future, and not just we who are involved in the negotiation at the present time. The collaborative attitude to negotiation attempts to see all the consequences of the resolution, not just now and for us, but in the foreseeable future and for everyone and anyone who may be affected directly or indirectly by our decisions. © Alcera Consulting Inc. 2013. We encourage the sharing of this information and forwarding of this email with attribution. All other rights reserved.